Mantel pieces don't only just provide structural support, they're also a statement piece and usually the focal point of your room, it can define your room and we know it is important to get it right - this is why we give you the option to customise your own. 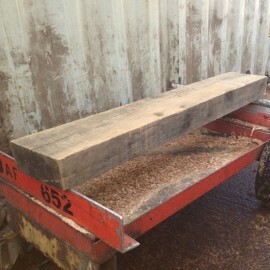 Our Oak Beam Mantels are made to order from partially dried, new untreated oak sleepers and are available in a rough sawn or planed all round (P.A.R) finish. Supplied untreated as standard, you're free to choose an oil that suits your requirements by taking a look at our range of Treatex Hardwax Oils - these hardwax oils are available in various colour tones, finishes and tin sizes. 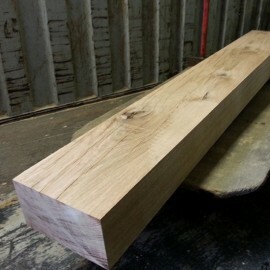 As an additional service, if you would like us to oil your mantel piece for you, we can! Our workshop will oil your mantel in a clear gloss, clear matte or clear satin finish; simply add your preference to your basket along with your chosen mantel piece and we'll do the rest for you! Small Uniform Adzing - this gives a 'manufactured' look by uniformly distressing the two front edges of your mantel, leaving you with a square edge to go against the wall for firm installation. Random Waney Adzing - this gives you a more natural look. We will randomly distress the two front edges of your mantel, leaving you with a square edge to go against the wall for firm installation. Simply add your chosen service to your basket along with a mantel of your choice. 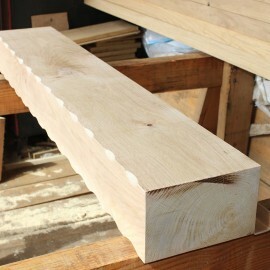 As our mantels are created from a natural product, each piece will be unique. Made from dried pieces of oak, they will contain surface cracks, splits and knots; there may also be one or two waney edges. As your mantel acclimatises to its surroundings, there may be further surface cracking and splits - adding further character to your beautiful oak mantel piece. If you're unable to find a standard size that fits your requirements, we can custom cut your mantel piece to your specified dimensions! Please visit our Custom Cutting Calculator where you can input your required dimensions and a price will be automatically calculated for you!